When we were living in South Africa, I decided to do a month-long of grain-free eating. (no gluten, rice, oats, quinoa, ya know...grains). I decided to do it just for fun, not related to any health issues. That may seem like a strange practice, but I truly enjoy the idea of "going without" something. If you go a month without sugar, it is amazing how incredibly sweet a blueberry tastes. If you go a month without bread, a simple slice of whole wheat toast lightly buttered tastes absolutely decadent. Something about making a choice to say "no" to something I find to be very healthy, a great practice of self-control and an act of gratitude for the things we have. During that time, a friend of mine passed on a recipe she had for a flax seed focaccia bread with italian spices. I made it and fell for it. It was the perfect partner with some homemade hummus (recipe coming soon!) and sliced cucumbers for lunch. Crisp, fresh, simple. It was one of those recipes I have stuck in my back pocket to make again and again, and share with friends who have certain dietary restrictions. I added a cinammon and organic sugar topping that is COMPLETELY optional, but added a little extra UMPH to the game. Feel free to omit it to keep it ultra "clean"! Prepare 8x8 baking pan by laying down parchment paper, allow to come over the sides. Add all the wet ingredients into the jug of your blender + blend until well incorporated. Pour the wet mixture into the bowl of dry + stir until incorporated. Let this sit while you prepare the topping (optional). 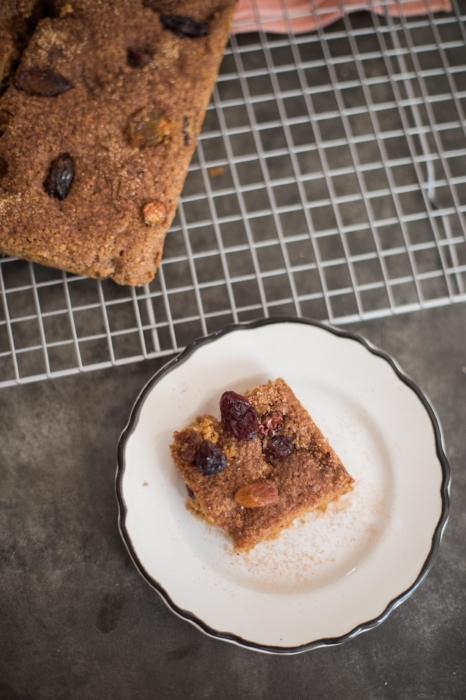 For Topping: mix the cinnamon + sugar in a small bowl, keeping raisins separate. Pour the batter into the prepared baking pan. 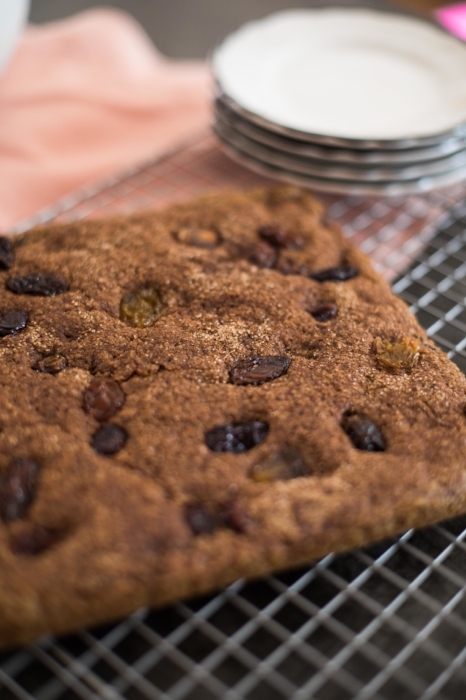 Sprinkle with the sugar mixture if using, followed by the extra raisins. Put the pan into the oven and bake for 20 minutes, until it is set and the top is turning golden. You can check by inserting a toothpick into the center of the pan. Let it cool. Remove from the pan by pulling up the edges to remove the bars and place them on a cooling rack to cool fully before cutting. Cut into squares, store in airtight container, preferably in the refrigerator. These are slightly crumbly because of the flax, so usually stick together better cold!